The personal price you pay in terms of health is great when you fail to reduce high cholesterol. But the poor health and increased threat of heart attack affect the wallet proportionate to the increased risk for heart disease. The cost of a first time heart attack or stroke occurring in people who failed to reduce their cholesterol was more than $13 billion considering both lost wages and hospitalization. For recurring heart attacks or fatal strokes the cost continues at $13 billion per year. Other indirect costs bring that total up to $53.6 billion per year according to an article in the Journal of the American Heart Association. The answer to lowering costs is to lower cholesterol. High cholesterol can lead to many different types of heart disease, including heart attack and stroke. When the risk factor of high cholesterol is coupled with a history of heart disease or stroke the risk of dying from some type of heart disease is increased by more than 4 times. Add to the mix high blood pressure or diabetes and that risk goes up to 6 times higher than average. The breakdown in costs for people with untreated high cholesterol includes $13.2 billion in acute hospital care, and the cost of preventing a second incident is roughly the same. Approximately $6 billion of that is related to death in people already with heart disease and another $7.4 billion toward treating those who have already had a heart attack or stroke. If you could put a cost on life – including quality of life – these staggering numbers are impressive enough. The reality is that life and good health are priceless. It is therefore important to reduce high cholesterol quickly and effectively. 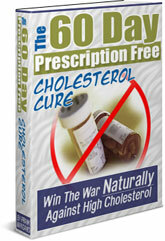 To take a natural approach and see fast results, get The 60-Day Prescription Free Cholesterol Cure.